Viggo Mortensen's friend, the actor Dennis Hopper, was once asked to define Viggo's art, and he summed it up this way: "It comes from the subconscious. You take it back into your subconscious and have your own conscious reaction." That's about as good an explanation as any for the art of a man as complex and enigmatic as Viggo Mortensen. Film fans will recognize him as the actor who plays the heroic character Aragorn in the Lord of the Rings franchise. Prior to that, he was in A Perfect Murder, GI Jane, Portrait of a Lady, Indian Runner, Carlito's Way, Witness and Crimson Tide. Several of Mortensen's murals were featured in the 1998 film A Perfect Murder (co-starring Michael Douglas and Gwyneth Paltrow). Typically, what he paints is a multi-media blend of several art forms. Poems and photographs are layered in paintings, obscured, written over, then painted again. To say that Viggo Mortensen is a Renaissance Man would probably be an understatement. He writes. He paints. He pens poetry. He takes photos. He acts. His art and photography have been shown at galleries in New York, Los Angeles and Greece. His most recent showing, at Track 16 Gallery in L.A., drew 1,500 curiosity seekers at the opening reception. Mortensen shrugged it off. "I don't object to the fact that obviously some people are here because of the (Lord of the Rings) movie," he said. "It's not because they've seen my paintings before. But once they're here, I hope they like it. If they don't, they don't." He admits to not knowing much about twentieth-century painters. "I operate on instinct and intuition rather than an intellectualized approach to art-making," he said. "Every so often, somebody will tell me about a rule, but eventually I always end up asking myself, 'Why does it have to be this way?'" One look at a Viggo Mortensen painting, and you know right away he's a rule-breaker. Found objects are treated lovingly and elevated above their humble, throwaway status. Sponges, rugs, wire, tape and nails adorn paintings of all sizes and shapes. Color and black-and-white photographs, taken deliberately or snapped on the run, are juxtaposed with old, found images that may be altered, scratched and manipulated by the latest digital technology. Old and new rub against each other in textured works that suggest a fractured narrative comprising the artist's visual and emotional memories. Mortensen is prolific. "The garage is full of paintings of all sizes, some of them quite large," he said. " But despite the crowded conditions, he isn't eager to sell anything. He's attached to his stuff and doesn't want it to leave home. Still, at the Track 16 exhibition, where 60 photographs and 15 paintings were on display, small photos were selling for $350, while paintings and large photos were fetching up to $5,000. Mortensen said painting and acting are both art forms, but with little in common. "When I paint, the process and the results are mine. I have full artistic control. Whereas in a movie, by virtue of the medium, the end result isn't my own." Mortensen has written four books, all compilations of his art, photography and poetry. The two most recent volumes - Sign Language and Recent Forgeries - were met with critical acclaim. He's been applauded for an approach to art that is authentic and emotionally honest. That's not easy to find in a world that often values irony and cynicism above all else. 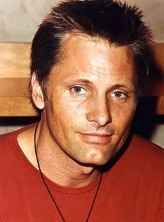 Viggo Mortensen was born in New York City on October 20, 1958, to a Danish father and an American mother. His family travelled a great deal and he spent parts of his youth in Venezuela, Argentina and Denmark. He finished school in the States, earning a dual degree (in Spanish and government) from St. Lawrence University in New York in 1980. He began acting in New York, where he appeared in several plays and movies. Eventually, he moved to Los Angeles, where his performance in Bent at the Coast Playhouse earned him a Drama-logue Critics Award. Mortensen began taking pictures as a hobby while still a child. Over time, photography developed into a passion. Painting didn't creep into his artistic repertoire until he was nearly 30. Today, it is just one of many art forms that help define this man of many talents. Mortensen takes the mundane - a simple gesture, a seeming coincidence, accidental encounters, changes of light - and incorporates them into his art as a means of capturing (and recapturing) moments of his life. That way, he can understand more, satisfy his sense of curiosity and express his wonder at the "suchness" of things.